In honor of Patricia Ann Medina, who dedicated herself to selfless service and helping others, all proceeds will go to support the Cancer Resource Center of the Desert and the Imperial Valley College Foundation on Saturday May 5th. Come dressed in red or pink to support the cause! 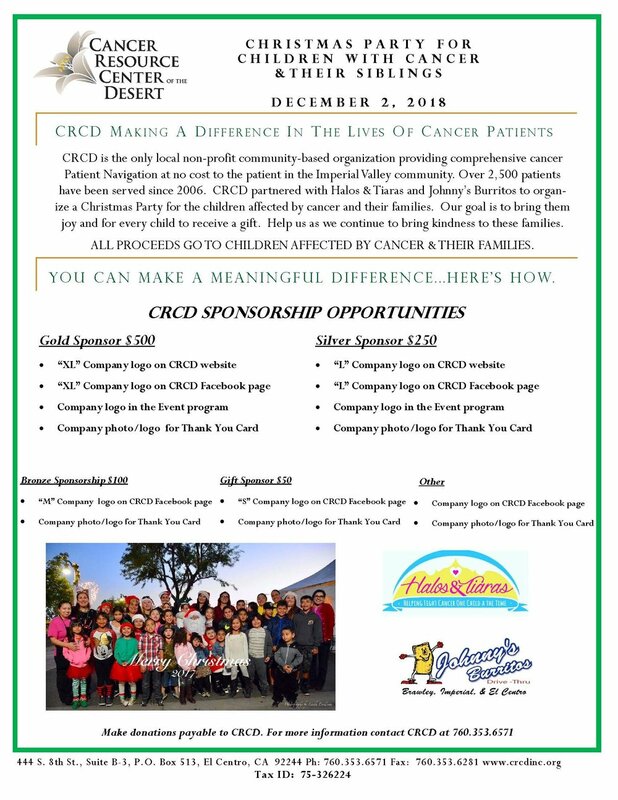 As we plan the Third Annual Christmas Party for children diagnosed with cancer and their siblings, we invite you to sponsor our event. Our goal is to bring them joy and for every child to receive a gift. Cancer Resource Center of the Desert (CRCD) is hosting the 2nd Annual Casino Night Gala @ Imperial Valley Expo/Casa de Mañana on April 28th, 2018 6pm to 1am. It is a night full of elegance and fun in which you are also supporting the Cancer Resource Center of the Desert. CRCD has helped more than 2,400 cancer patients with its patient navigation services. CRCD was granted a second time to fund a program for women diagnosed with Metastatic Breast Cancer (MBC) and their families through Avon-Pfizer Metastatic Grants. We successfully helped more than 18 women diagnosed with Metastatic Breast Cancer and their families. As we close our 2017 MBC Program, we want to share the story of one of our dear patients, Rebeca. My name is Rebeca. I was born in Tijuana, Mexico into a large family. At the age of 19, I got married and moved to San Diego, California and had my daughter Rebeca Eugenia in 1994. My husband went into the military and soon after we moved to Clarksville, Tennessee where we lived for 5 years. My son Arturo was born. My husband got discharged from the military and became a federal agent for the Border Patrol. We then moved to the dusty hot El Centro, California. I have lived here for the past 16 years. 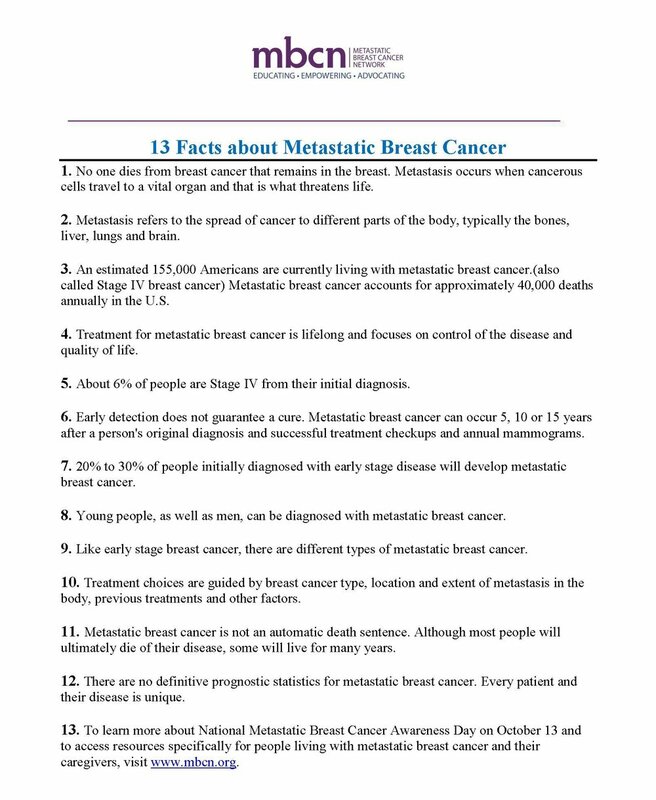 The day of my 37th birthday in 2008, I was diagnosed with Metastatic Breast Cancer, Stage IV. I was told my cancer had no cure. I could only think about my two children. My daughter was 14 and my son was 9. In my prayers, I begged God to let me see my children grow. I went through chemotherapy, a mastectomy, and radiation. Since 2009, every 3 weeks I commute a 2-hour drive to San Diego, California to receive my medical care. Same drive to receive the infusion that has kept me alive, Herceptin. I also take a Letrozole every day. This illness has taught me to live my life to the fullest and to truly enjoy each day. To always fill my days with nothing but positivity and laughter. In 2010, after finally divorcing my husband, I moved on my own with my two kids. Since then, I have lived a freeing life without any feelings of insecurity and fear. I was able to see my daughter graduate with her Bachelors in Biology and Psychology and soon I will see my son gradate high school. Many things have changed in my life. I have accomplished many things I never would have dreamed before cancer. I have grown as a person and I have met and been a part of the lives of many women living with stage IV breast cancer just like me. I love being a part of these women’s journey. The most important thing for me is to show these wonderful women that they are not alone. In just these past few years, I have witnessed how this illness has extinguished the lives of these beautiful women. I have vowed to continue with my journey as long as I can and to use my time to empower other women in honor of those who have gone on ahead of me. We want to share the article Imperial Valley Press printed on October 29, 2017. The information is very accurate. Thank you IV Press! CRCD would like to thank Avon-Pfizer Metastatic Grants Program for graciously awarding for a second time, funding a program for women diagnosed with Metastatic Breast Cancer and their families. We are delighted to be able to help these courageous women and their loved ones. It is important to understand what "Living with MBC" means. We are providing 13 Facts that you should know and have translated into Spanish. CRCD fue otorgado otro año más de fondos dar servicios en un programa para mujeres con cáncer de seno metastásico y sus familias. Estamos encantados de poder ayudar a valientes mujeres y a sus seres queridos. Es importante comprender que significa el vivir con cáncer de seno metastásico. Aquí están 13 Hechos que hemos traducido para ustedes. Published online on this June. CRCD is proud to announce that this article is open for the public. CRCD, Helen Palomino, Diana Peacher, and Mercedes Watson collaborated with SDSU, School of Social Work and Center for Alcohol and Drug Studies and Services. In honor of Patricia Ann Medina, who dedicated herself to selfless service and helping others, all proceeds will go to support the Cancer Resource Center of the Desert and the Imperial Valley College Foundation on April Saturday 29th. The Cancer Resource Center of the Desert (CRCD) is celebrating its 10th year anniversary with a Casino Night Gala @ Imperial Palms Hotel & Resort in Holtville on April 7th, 2017 6pm to midnight. During the gala there will be $100 tickets for a game of chance. Prizes include $20,000 necklace, $3,500 Golf Bag, and "A Day Out at Sea." This consists of a private yacht accommodating 24 people, includes lunch, drinks and roundtrip from Newport Beach Harbor to Catalina Island. Gala tickets are $60 per ticket includes dinner, no host bar, entertainment, and $500 players club card. Special guest, Mike Haynes, NFL Hall of Fame, as event's keynote speaker and Aquile from The Voice 3. It's the time of the year for Desert Lily Campaign 2017! Sales throughout January and February. If you would like to support us, call us! You can be one of our sellers! Every year CRCD and the committee choose a different theme for our annual fundraiser. This year we are “Beating the Odds” at the Survivor Fall Fest. CRCD invites you to participate in this year’s fundraiser event where we honor our survivors and remember the fallen. Not only the Survivor Fest is a big party filled with entertainment, food, and games but it is also the fundraiser that helps keep our doors open for our community. All proceeds stay in Imperial County to assist cancer patients in our community; children, adults, men and women. Let us know if you're interested in forming a team! Our goal is to have 50 teams. We are going to need all the help we can get! Give us a call to (760) 353 6571 for more information. Learning about Cancer Prevention, Diagnosis, and Treatment. This Cancer Symposium was held Saturday June 4th, 2016 from 9 am to noon. CRCD would also like to recognize Master of Ceremonies, Daniel Ortiz, Jr., MBA/MSN, RN, PHN of Imperial Valley College's School of Nursing (IVC) and all his support for this event. CRCD wants to invite you to this year's Cancer Symposium at Imperial Valley College. We are having the Valley's leaders in oncology all in one place! Dr.'s Ahmed, Oral, and Vakilian will present on topics ranging from cancer diagnosis, treatment, and clinical trials. We will also have Dr. Rodiles who's presidential appointment sees him leading healthcare between the US and Mexico as well as, a presentation by Dr. Estrada surrounding nutrition. This event is open to the public at no cost. Saturday, June 4th at IVC's new Science building (2700, auditorium). Registration opens at 8am. Presentations from 9 a.m. to 12 p.m. Snacks and beverages will be provided. *Servicios de traduccion estaran disponibles para las personas que solamente hablan Español. RSVP with CRCD: 760 353-6571. We hope to see you there [please see the attached flyer image for details PM us with any questions or looking for .pdf version of this flyer] and please feel free to like, print, share, or post. 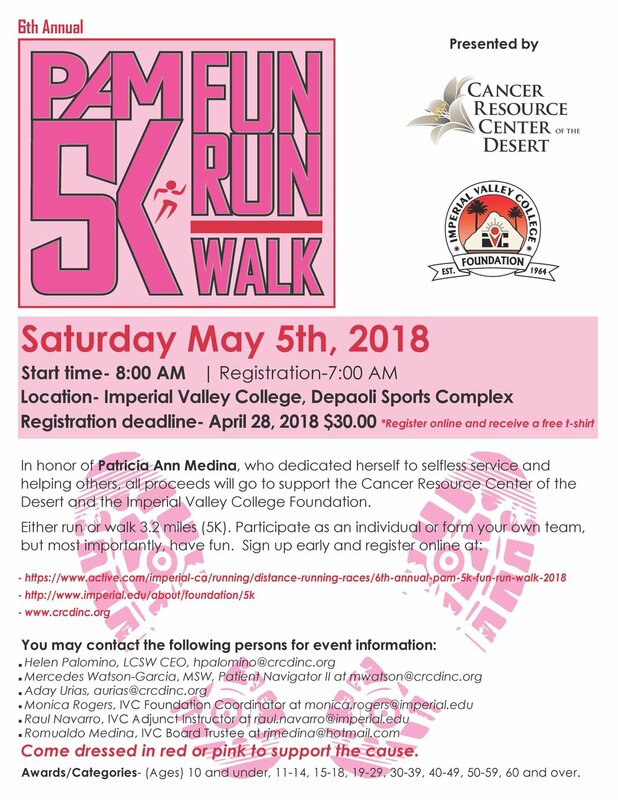 In honor of Patricia Ann Medina, who dedicated herself to selfless service and helping others, all proceeds will go to support the Cancer Resource Center of the Desert and the Imperial Valley College Foundation on April Saturday 30th. Either run or walk 3.2 miles (5K) and after you cross the finish line join us for more fun in at the IVC Swimming Pool. Parking will be Free and the lots south of the gym will be the best to use. Bring your registration email along with a swimsuit if you plan on swimming after the Fun|Run. 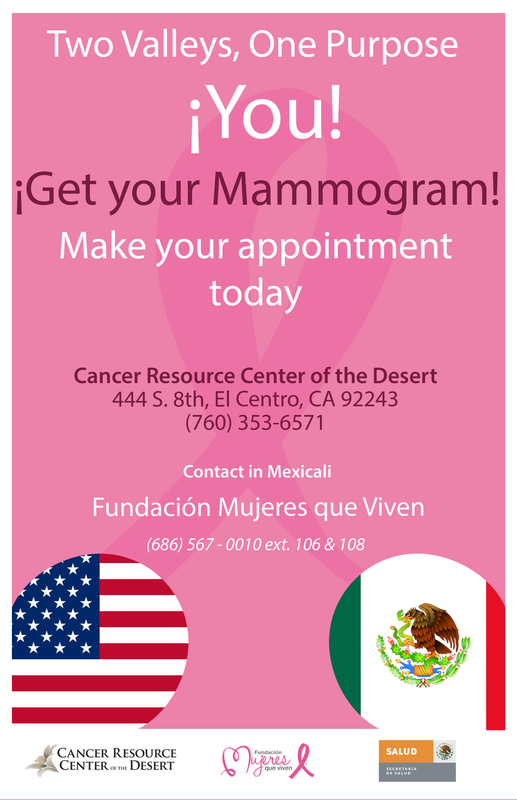 The third annual "Two Valleys, One Focus YOU" is a binational mammogram campaign partnered with Mujeres Que Viven in Mexicali. Ladies make your appointment today! 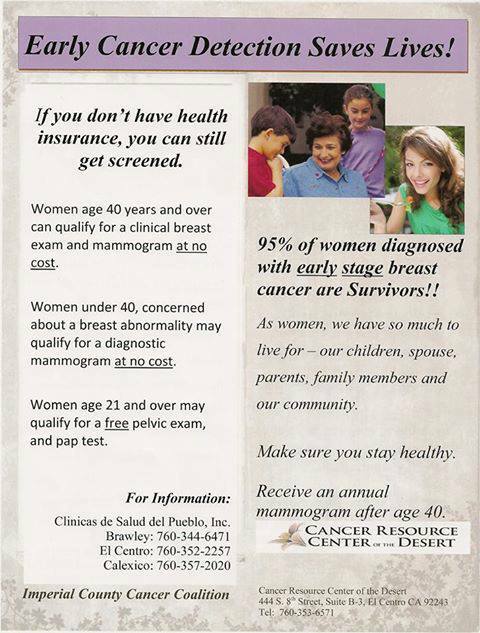 For women who do not have health insurance, there is a program that does breast screening for free based on age. On the day of the event, the main registration site for the 3:10 to Yuma Charity Bike Ride is in in the Dillard's parking lot at the Imperial Valley Mall. Same day registrations starts at 6:30 a.m. Ride starts at 8 a.m. This is not a race, but we would like everyone to start together. There are two separate start lines: 60-mile ride from Imperial Valley Mall in El Centro to the Colorado River--4th Avenue exit in Yuma. The 30-mile ride starts where Highway 98 ends at Interstate 8 . $30 pre-registration until February 15, 2016. It's the time of the year for Desert Lily Campaign 2016! If you would like to support us, call us! You can be one of our sellers or simply purchase some flowers.